The arcane displacer drive represented a major breakthrough in vector design. Freed from the hampering influence of gravity, heavy vectors equipped with this technology such as the Conservator, Assimilator, and Modulator gain unparalleled freedom of movement. 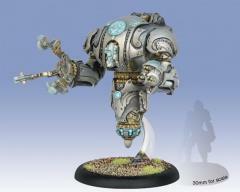 The Conservator is equipped with heavy shields and low-traction gyros that allow it to intercept attacks. The Assimilator fires its dissevering microswarm launcher to shower the target area with an explosion of bladed gears. Coruscating with electrostatic energy along its hull, the Modulator can channel this charge into a bolt of pure energy that electrocutes everything in its path. This box set contains three color stat cards and one multi-part heavy vector plastic model. Included are all the components to assemble one of three heavy vector variants: Assimilator, Conservator, or Modulator. A player may field any number of these vectors in a Convergence army.